Big Finish: Doctor Who - MOTHER RUSSIA Review | Warped Factor - Words in the Key of Geek. 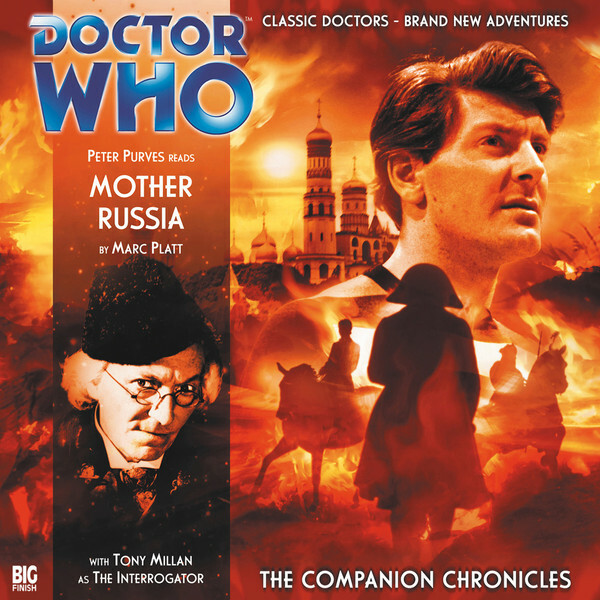 Mother Russia is only the fifth Companion Chronicle that Big Finish produced, launching its second season with a First Doctor story, just as it had launched its first. It also marks the arrival in the Big Finish universe of Steven Taylor actor Peter Purves, and reveals for the first time that he does a more-than-passable impersonation of William Hartnell. Big things were to come as a result of this first experience, to the extent that Taylor has had his back and his forestory hugely increased and improved upon in audio from what we saw of him on-screen, and his sometimes regrettable but often all too necessary roles as the fighter of bad guys, and the prop to Hartnell’s increasingly unreliable memory. Purves, for his part, has honed both his Steven and his First Doctor over the ten years since Mother Russia was released in October 2007, and continues to help us enjoy new adventures with the First Doctor to this day. Mother Russia itself is an intriguing concept – but then you’d expect nothing less the moment you learn it’s written by Marc Platt, the mind behind the likes of Ghost Light and Spare Parts. Steven imagines himself to be in his dying moments, his life ‘flashing’ before his eyes, at the prompting of a spiky and acquisitive inquisitor, who challenges his sense of self by claiming that in fact he, the inquisitor, is Steven Taylor. Only by recalling events of the last few months can Steven lay claim to his sense of self. The sense of self, of identity, is a theme throughout the story, which as the title suggests, lands the First Doctor, Steven and the generally underrepresented Dodo in Russia in 1812. Platt delivers the sometimes Quixotic nature of the First Doctor well in his premise, because even though it’s clearly a pivotal moment in Earth’s history, with Napoleon and his immense French army on the march in the winter of that year, the Doctor decides the crew deserves shore leave and cabbage soup, and the three ingratiate themselves first with the local peasantry, and then the landowner of the region – the Doctor becoming a tutor, Dodo a companion for the lord’s daughter, and Steven, with his less distinctly useful skillset, taking a position as the lord’s woodsman. As occasionally happened in the First Doctor’s time (bound rather more strongly as it was than any of his predecessors by the real world imperative to be an educational show), they settle down for an extended break in the period, and we learn about the rhythms of the serfs’ lives, with Steven in particular learning to unwind, making a strong friend, and rejoicing as that friend approaches his marriage to a local girl. All of this backstory is delivered without any particular sense of hurry, as though Mother Russia is settling in to be a long meander in the vein of Marco Polo or The Reign of Terror, nothing more than a to-and-fro in the ebb and flow of history. But no. There’s an alien all right. The point is, it doesn’t arrive for some considerable time, meaning you settle comfortably in to both the time and place, and to Purves’ narration, slipping from Steven to the Doctor to Dodo, to all the other characters we meet, bar one – his inquisitor is played by Tony Millan. It becomes clear from the interviews at the end of Mother Russia that acting work had more or less dried up for Purves by the time Mother Russia was recorded, but presenting work and voice work were still strong planks of his career. It’s a fact that serves him well in this first outing in the Companion Chronicles, his control over his voice and his ability to naturally tell a story in the audio medium meaning Mother Russia is an easy listen, while Platt’s script begins to build a kind of ‘revised Steven,’ taking what we saw on-screen and giving him much more of a history, much more in terms of an inner monologue than ever for the most part came out on TV. The story changes its direction when the alien arrives – in fact you could more or less argue that it’s a re-run of the fundamental events of The Horror of Fang Rock, a creature from the stars able to take other forms as necessary, but there are subtle differences, and Platt does interesting things with those differences, giving hat-tips to movies like The Thing, but also showing the nature of the alien as being less than fully under its own control. There are plenty of levels of tragedy and tension layered in Mother Russia – the heartbreak of a young woman whose betrothed is changed forever and spurns her, the inevitable, increasingly jitter-building approach of Bonaparte’s war machine and the slaughter it entails to the Russian people, the potential alien threat which could see the creature ascend to the highest levels of power. But perhaps the most potent pulse in Mother Russia is the ordinary terror of the serfs when one of their own seems to be bewitched, and the panic that fear allows to breed in the crowd; if there is a bewitchment, then there are witches or sorcerers, and who would they be but the in-comers? If you choose to read it this way, Mother Russia has its punch of relevance to our own world, which while generally satisfied was generally welcoming, but which, awoken to the threat of terrorism (the modern witchcraft), has proved itself all too eager to throw immediate and indiscriminate blame on the in-comer, the different, the Not-We seeking to be We. And, just to follow the comparison through, there’s something genuinely Not-We at the heart of Mother Russia, benefitting from all the confusion and fear, and moving up the ranks of our society in leaps and bounds, striving ultimately towards imperial power, and control of the world. (Yes, Mr Farage. Yes, Mr Trump. Yes, Mr Bannon, we’re looking at you). Steven, a fee-thinking man with his own pain at the loss of a friend in a world going rapidly to hell, struggles on, trying to make sense of things, trying to maintain his understanding of truth and lies, of what’s impossible, and what’s just highly improbable, and through the course of Mother Russia, almost everyone he knows gives him cause to question himself – a fact that’s meat and drink to his inquisitor as he tries to persuade our Steven to relinquish his identity. But Steven won’t. That’s the ultimate point of defeat for the insidious alien in Mother Russia. One man, Steven Taylor, will not give it what it needs. Will not give it his acquiescence. Will fight, and fight, and fight again until there isn’t the last scrap of fight left in him. And so – not without some persuasive talk from the Doctor, granted – it’s Steven who stands in the forefront of defeat for the alien here, letting the story unfold very much AS a Companion Chronicle, rather than as a Doctor Who story in which there were companions present. Mother Russia re-introduces us to Steven Taylor, but it gives him the time, the space and the words to be far more interesting than he was allowed to be in on-screen Doctor Who. Proving the value of the Companion Chronicle range early in its run, it’s still a cracking story ten years on, steeped in First Doctor atmosphere and characterisation, but going much deeper into the personalities of the people the Doctor chooses to travel with than the headline show ever did in the Classic era. Mother Russia is the beginning of the long process of the redemption of Steven from the necessity of his on-screen roles, and the building of a character who deserved his shot at travel through the infinite possibilities of time and space.